I was having trouble remembering the name of this little ghost town in the Arizona desert and was given a mnemonic: “You feed the wild donkeys oats, so… Oatman.” And that’s how I remembered the name of this town. We will come back to the burros in a moment. I just looked up the town in Wikipedia and, wow. It has an interesting history. The town is named after Olive Oatman, who was (presumably) kidnapped and enslaved by Native Americans. She was released near where the town currently is, and so they posthumously named the town after her. They did not name the town after the kind of food you feed the wild donkeys. Let’s talk about the Donkeys. The town is literally crawling with wild burros. They are descendants of the donkeys used during the town’s flourishing mining operation. They helped the miners carry equipment into and out of the mines. They now roam the desert and come and go as they please and serve as an interesting tourist attraction. These animals are protected by federal law and it is a crime to kill, hurt, or harass them. Instead we feed them. Interesting factoid: Clark Gable spent his honeymoon here, in the Oatman Hotel (see the photo below). 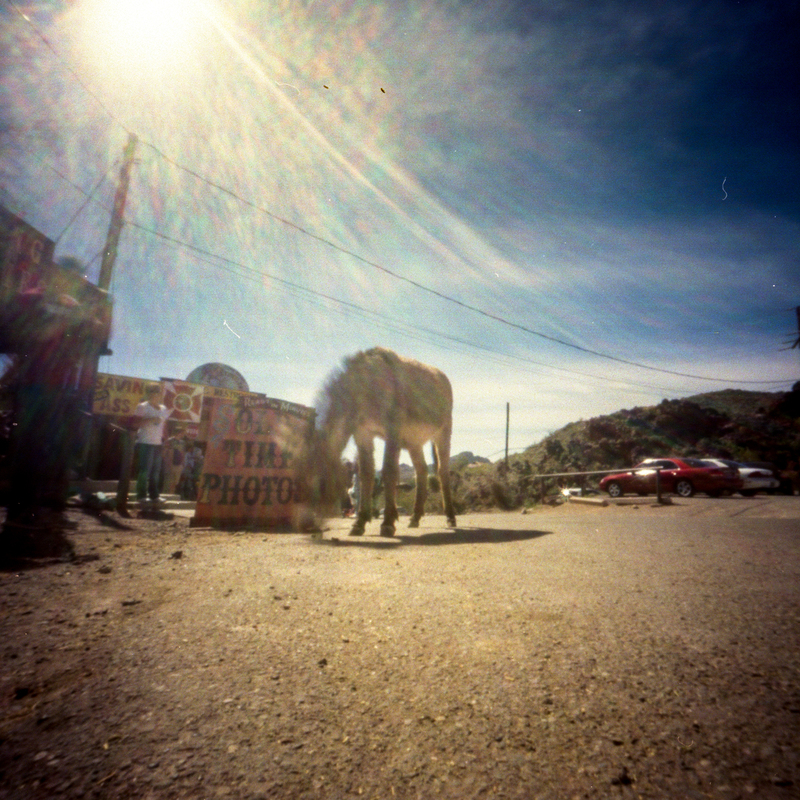 Oatman is on Route 66, which was once a widely used highway across the United States. It’s kind of sad to see it’s state now. There is so much romance around this highway. This particular visit to Arizona was my first visit to Route 66 and I was rather shocked and a little bit saddened by it’s current state. Many of the Route 66 towns are poverty stricken because they relied on that highway to bring traffic through them. But, I digress. Back to Oatman, specifically, and Clark Gable. Oatman was Gable’s favorite getaway from L.A. and he spent his honeymoon here. In this hotel. And, supposedly, his ghost roams it’s creaky hallways. 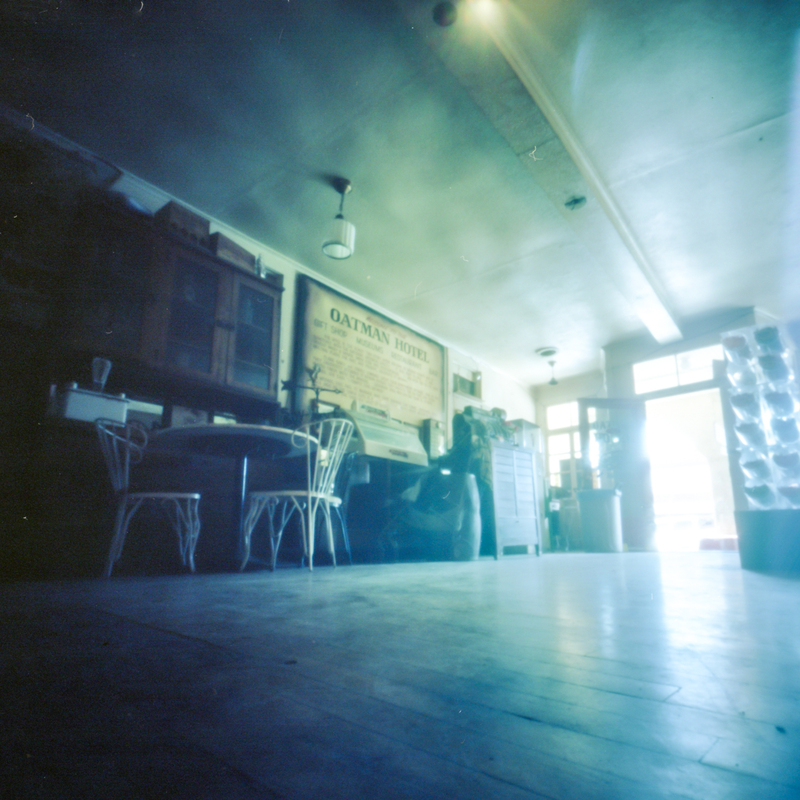 Here is a pinhole shot of the lobby. I love the old-west feel of the place. If Gable’s ghost isn’t here, the ghosts of cowboys are. Clark Gable spent his honeymoon here. 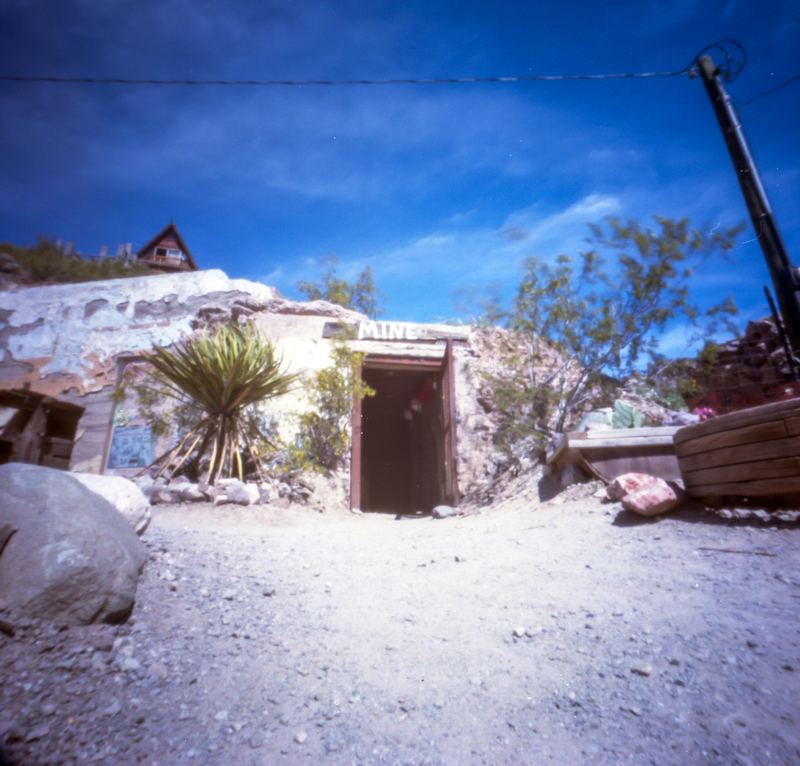 A post about Oatman wouldn’t be complete unless it had a photo of the mine, as this is a classic Gold Rush ghost town. So here is your mine. 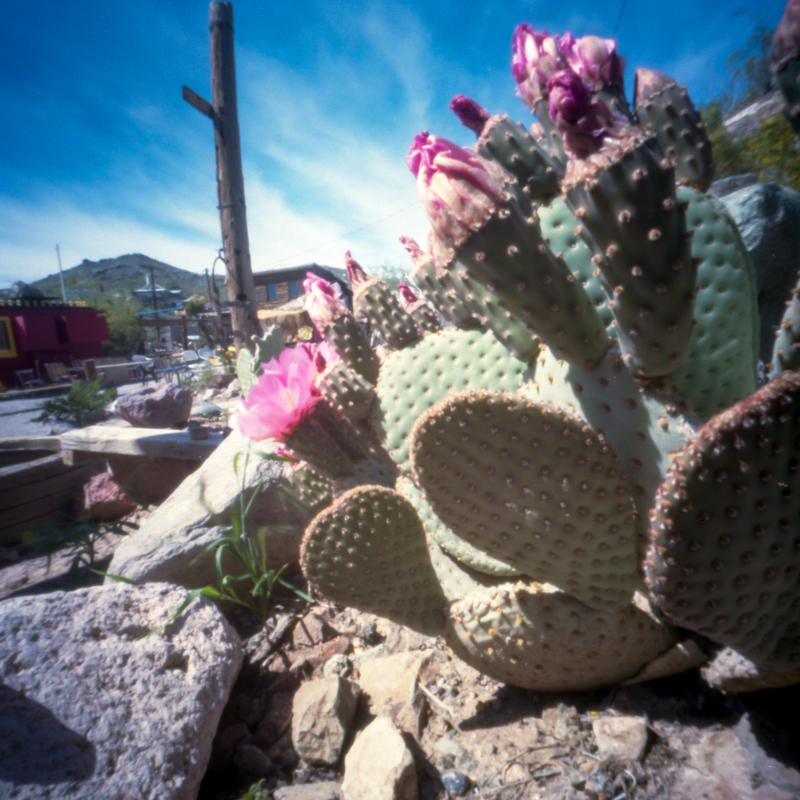 And here is a photo of a flowering cactus. These were all shot with my Zero 2000 and Portra 160. 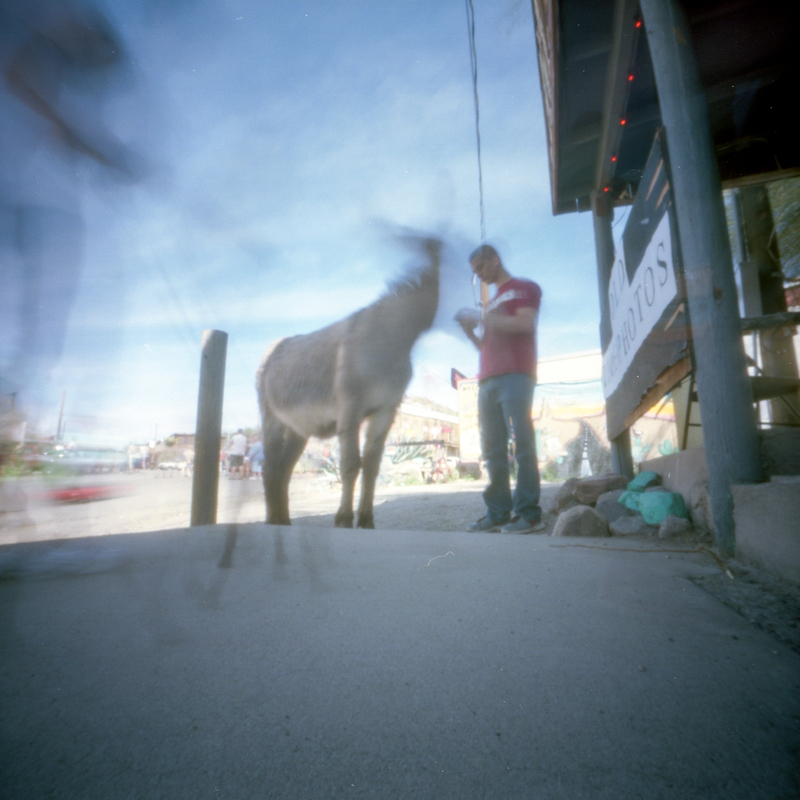 All of the shots were around 5 seconds, and were a bit over exposed due to the hot desert sun beating down on me. The shot inside the hotel is around 5 minutes (give or take). This is a million kinds of wonderful. I really want to get my kicks on route 66. Route 66 is super interesting. I can totally see the fascination with it. I wish I’d taken more photos while I was there. It’s a relic of a lost time. I really need to get back to the states….for now PO is doing the job. Thanks so much for sharing these! What a great find — I want to visit there too now!